You know how you can meet some people repeatedly and they never exactly leave an impression. Whereas other people you meet just one time and you never forget the encounter. Well, I met designer Sylvie Corbelin just once, years ago at her bohemian home in the Marais district of Paris and I remember it vividly. The designer served delicious Canapé sandwiches from the classic restaurant Carette and we chatted about art and inspiration. One thing Sylvie said, in her poetic way, that I have never forgotten was, “Earrings hold a special place in my life. I love that they bring beauty and light to the face of whoever wears them. 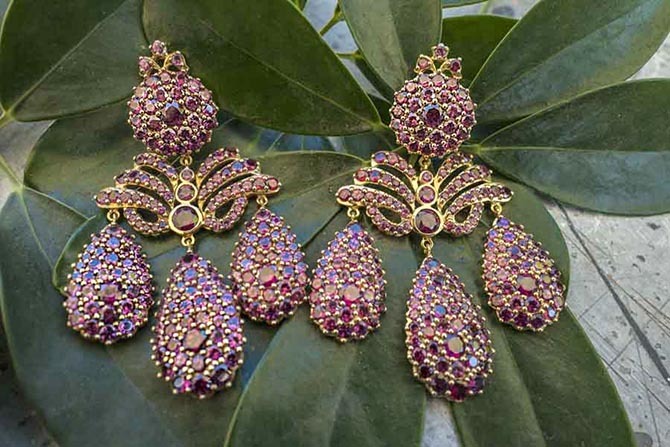 It is also the only jewel entirely dedicated to the Other.” We went on to discuss this concept about earrings being a gift for the people looking at the person wearing them in the philosophical way one does on a long afternoon lunch in the City of Lights. When I had the opportunity to see some of Sylvie’s work again recently while I was in Los Angeles, where her pieces are sold at the boutique Just One Eye, her words reverberated in my mind. 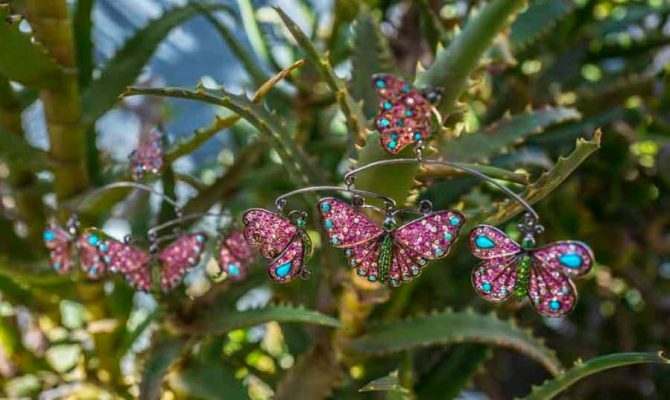 Following are more of the designer’s thoughts on a few of her magical earrings. For the Marquise Palace girandoles, I was inspired by an 18th century design that’s why I put the “Marquise” in the name. I added a joyful effervescence to the shape of the earrings with colorful stones. The “Palace” in the name is a reference to an infamous Parisian nightclub that was fashionable in the 80s and known for its dazzling evenings and crowd. These would be the perfect jewels to wear for an evening there. 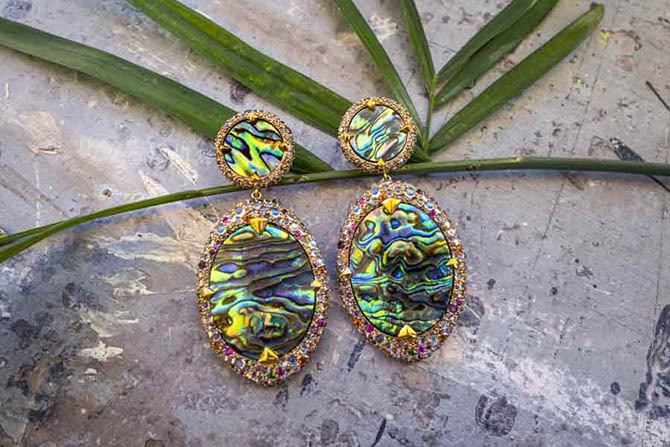 For the Abalone Dream Water Earrings, I wanted to provoke an emotion with the use of abalone and its fugitive light, like wet flames in the hair of a mermaid. Women and their beauty are very inspiring to me. I do not design jewelry in a conventional way. 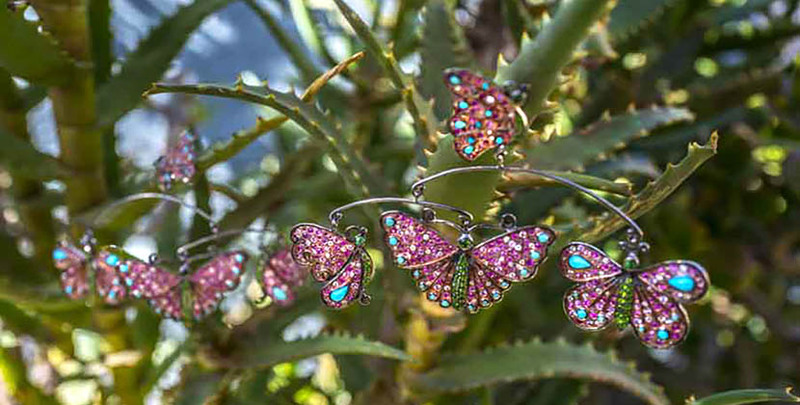 For these Butterfly Mobile Earrings, I tried to mix the rigor of balance with the joy and carefree movement of butterflies in the first days of spring. It might be representative of my philosophy of life.